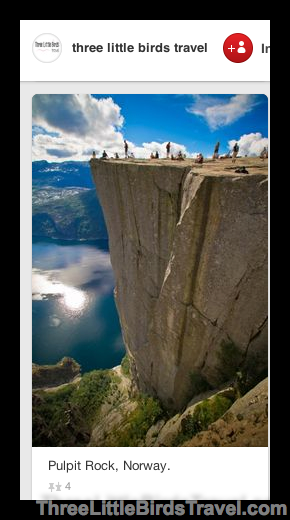 Hiking Pulpit Rock – Thanks Pinterest!! Calling all travelers – are any of you huge fans of Pinterest?? If you love traveling, then you should absolutely love Pinterest because they go hand in hand! I’ve found the coolest places to visit just by signing up and creating my board – Andiamo (It means ‘Let’s Go’ in Italian). One of my favorite finds was Pulpit Rock (Preikestolen) in Norway. Below is what I initially pinned. Does this even LOOK real??? I didn’t think so! So after some research I realized it WAS a real place that you could hike and I needed to go ASAP! Getting to Pulpit Rock is easy! When traveling to Norway in the summer, you’re probably going to visit the fjords anyway! Stay in Stavanger (we stayed at Victoria Hotel) and take the Rodne Fjord Cruise through the Lysefjord. The cruise is so breathtaking! While traveling through the fjords on the cruise, you make some interesting stops. My favorites were the goats (cause we had to feed them, of course) and the beautiful waterfall (we got to drink the fresh water)! The cruise drops you off at Tau, where you catch a bus that takes you to Pulpit Rock. This was very easy to figure out, but if you have questions, feel free to ask in the Comment section. Traveler Tip: Pulpit Rock took me and my sister about 1hr 45min to hike. We brought a small backpack filled with water, sun screen and snacks. We wore ordinary gym shoes which were just fine for the trail. Hiking Pulpit Rock is REALLY fun! Very scenic and a ton of friendly international hikers along the way! Very different from my Camelback hike in Arizona! At every turn, there seemed to be a different type of path which made the time go by pretty fast. Getting to the top of Pulpit Rock was SUCH an adrenaline rush! The view was nothing short of incredible and I know it was a moment in my life that I will never ever forget. The beauty went on for miles with clear blue skies and royal blue waters. After you get over the view, the people watching and pictures start! PEOPLE WERE SO BRAVE!!!! “What are they doing?” we said. “That person has their DOG up here!” I screamed. “Oh, we could NEVER get that close to the edge!” we declared. After about 10 minutes….we were doing the same crazy pictures! We couldn’t help ourselves!! You’re LITERALLY leaning off the edge of this cliff taking pictures. Crazy. We turned crazy…and I’m glad we did! Have you been to Pulpit Rock? Wanna go now? Share your comments below! I’d love to hear about hikes that you love from your adventures! « Under the Sea with Denmark’s Little Mermaid!